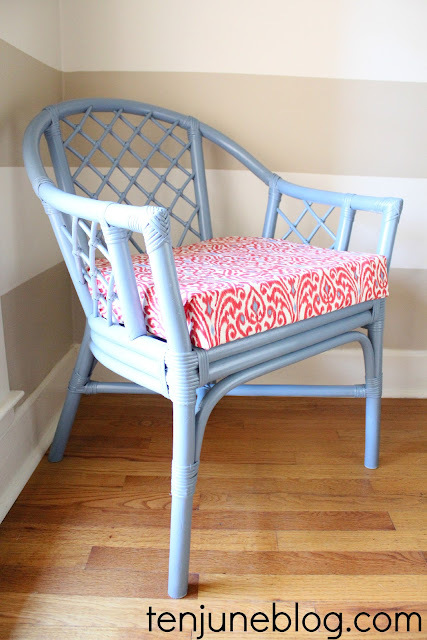 I also churned out a couple of fun projects over the weekend, like my new bamboo office chair. I picked up this little gal at my local thrift store for only $15. She needed some help, but has good bones, so I knew she would be a perfect fit in my home office. What chair is with the desk in there now, you ask? Um, there isn't one. In the two-and-a-half years we've lived in this house, we haven't had a chair at the desk. Lame, I know. We always pull in one of the dining room or kitchen table chairs. But starting at the first of the year, I'm headed back to work part-time. I am lucky enough to have the chance to work a lot from home once I start back, so I definitely need to carve out a nice work space here at the house. And I thought it would be smart to start with a chair to sit in. Always a priority. First step? I lightly sanded the bamboo chair down and then coated it with a few (very light) coats of primer spray paint. It felt good to get my spray painting trigger finger going again, it's been awhile! Next, I coated the chair with a few light coats of Rustoleum's satin finish color Slate Blue. 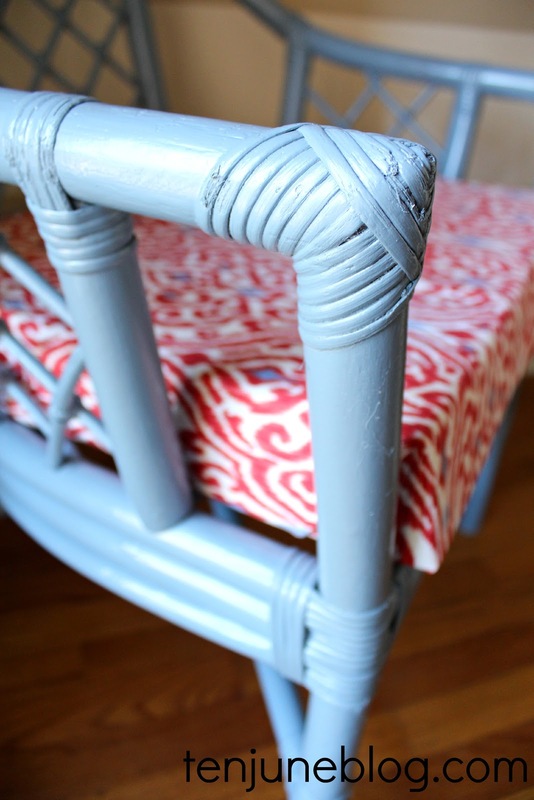 I think the bluish gray looks perfect with the bamboo details of the chair. Next, I needed to add a seat cushion. The chair didn't come with a cushion or even a wooden board to nail a cushion to, so I had to improvise. I bought a thick, three inch wide foam pad at JoAnn Fabric and Craft Store (with a coupon it cost about $10). Then, let's be honest, I went sort of ghetto with the project. I am sure the best method would have been to measure and trace the outline of the seat onto the foam and then use an electric knife to cut the thick foam to its proper measurements. Or you can be crazy like me and hack away at the foam with a pair of scissors. Just sayin. Both work. Once I got the foam in its altered (ie. hacked up) form, I simply wrapped it with fabric (also from JoAnn Fabric and Craft Store, with a coupon it was about $6 for 1.5 yards) the same way you would wrap a present. The top rounded corners of the seat were a tad difficult, but nothing that some major tucking didn't take care of. 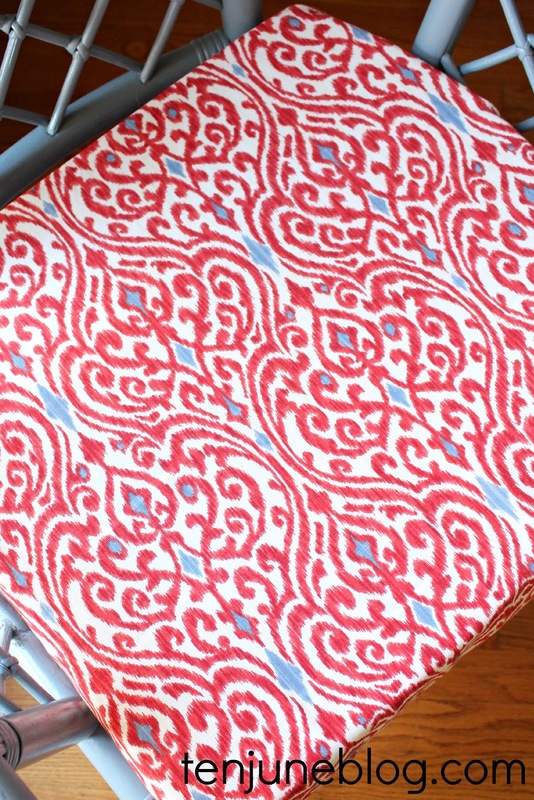 Normally, I would staple the fabric to a cushion like this with a staple gun. But because I didn't have a wooden board behind the cushion (and because the uneven bamboo bars on the seat of the chair wouldn't have permitted me adding a wooden board), I went with my next best option. Duct tape. Yeah, I did that. Don't judge. It's what we do here in the south. And I don't think the seat cushion looks like it's duct taped from the front. If you do, just lie to me and tell me it looks good. Mkay? Ta-da! Here's the finished product. Because I was too lazy to clean up and stage my entire office, the chair is sitting in the corner for pictures. But it does give a good view of my DIY linen memo board with fabric pockets and some of my other DIY art like the nailhead trim piece and my paper mache deer head. Overall, I'm pretty excited about this piece. It cost about $40, which you can't beat. And it makes me excited to take on a few other projects in this room so that I've got a sweet space to get some work done. I think I'm off to a good start! Great choice of colour & fabric! It looks awesome!! Great color choices! 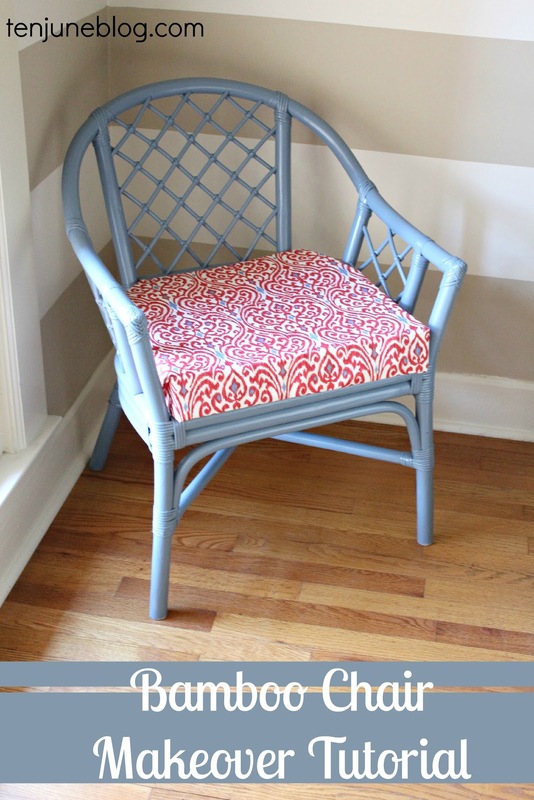 Love the shape of the chair, the color and the pretty fabric!! Oh I love this!! You're right - it's the perfect color. I love the fabric you chose and who cares if it's ghetto underneath?? It looks good from the front and that's all that matters! The chair looks great! What thrift store to you find your awesome deals? I'm in Atlanta, too, and after I get through the holidays, Operation Office/Spare room begins. And I love the duct tape. If you ever need to wash the fabric, it will be easier with the tape, too. This chair makes me so happy! I love the combo of colors and how easy it looks to do. Off to Goodwill I go! Michelle! It looks great. I love the fabric in there. I also love the duct tape! Girl after my own heart. Happy Monday!!! And yay for date night! So glad you guys had a good time! Looks great! Love the duct tape solution too haha. Yippee for date night! The chair turned out great -- the color combo is perfect! 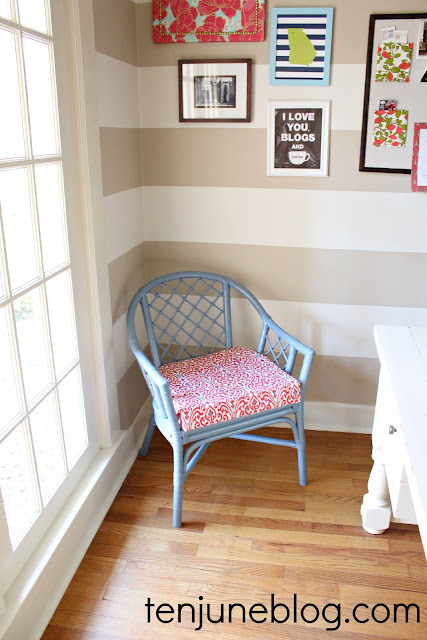 It will be such a cheery chair to work from! I love the color you chose with that fun fabric! Hope you have a happy Thanksgiving, Michelle! Work with what you've got is what I say! No one will be the wiser (well, besides your faithful blog readers, of course) and the chair looks great! 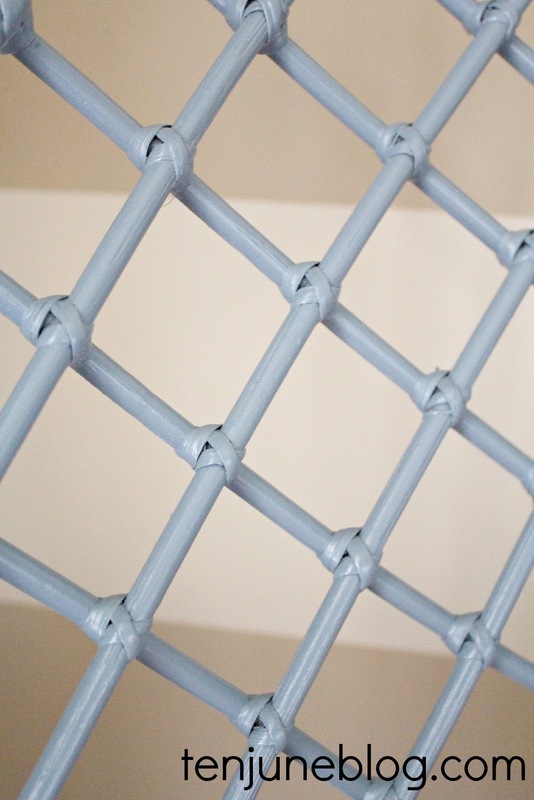 This is super cute (love the colors) and I really love that you used duct tape. Genius.